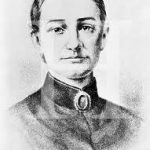 Sarah Apthorp was born in Boston, Massachusetts to the wealthy Boston merchant, James Apthorp and Sarah Wentworth Apthorp. She was baptized at King’s Chapel on August 29, 1759 (the exact date of her birth is unknown). Her family eventually numbered eleven children. Sarah lived in the Apthorp mansion in Boston until she was ten, when her family moved to Braintree. She acquired an unusually thorough education, read extensively and formed the habit of writing verse in childhood. Sarah was so proud of her mother’s family that as a girl she took the name Sarah Wentworth Apthorp; after her marriage she used the name Sarah Wentworth Morton. Perez Morton was the son of Joseph Morton, the proprietor of the White Horse Tavern in Boston. During the Revolution he practiced law and was a leading member of the Committee of Safety. In April 1776 he won acclaim for his delivery of the funeral address for General Joseph Warren, who had been killed during the Battle of Bunker Hill. In 1778 Perez Morton served as a major and aide-de-camp in the Continental Army. Sarah Apthorp and Perez Morton were married at Trinity Church in Boston on February 24, 1781, and moved into the brick house in Boston where Sarah had lived until her family moved to Braintree. They had five children. Sarah Apthorp (1782–1844), Anna Louisa (1783–1843), Frances Wentworth (1785–1831), Charles Ward (1786-1809) and Charlotte Morton (1787–1819). The Mortons became members of a prominent social circle. Along with several other prominent couples, they formed a club in the winter of 1784–85 for playing cards and dancing. Although bets were limited to twenty-five cents, the group’s activities were criticized in the newspaper and satirized in a play, Sans Souci, alias Free and Easy:-Or an Evening’s Peep in a Polite Circle (1785). The Morton home became a gathering place for Boston literati, who encouraged Sarah’s literary efforts. Until 1788, she served the role of traditional housewife and mother, only circulating her writings among family and friends. A more serious public scandal involving the Mortons, publicized in the Boston newspapers in the summer of 1788, undoubtedly caused Sarah Wentworth Morton great pain. 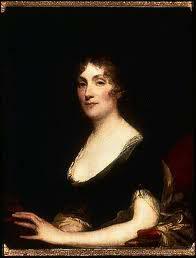 Two years earlier, Sarah’s younger sister Frances “Fanny” Theodora Apthorp (1766–1788) had come to live with the Mortons in Boston. In the summer of 1788 the affair became public knowledge. On August 28, 1788, instead of confronting Perez Morton as her father had requested, Fanny left a note begging forgiveness from her family, especially her sister Sarah. Because of the publicity of the affair and family pressure, Fanny committed suicide by taking poison. We are happy in being able to announce to the public, that the accusations brought against a fellow citizen, in consequence of a late unhappy event, and which have been the cause of so much domestic calamity, and public speculation, have, at the mutual desire of the parties, been submitted to, and fully inquired into by their Excellencies JAMES BOWDOIN and JOHN ADAMS, Esq’rs, and that the result of their inquiry is that the said accusations are not, in any degree, supported, and that therefore there is just ground for the restoration of peace and harmony between them, and in consequence thereof, they have recommended to them, with the spirit of candor and mutual condescension, again to embrace in friendship and affection. The scandal was so well known that there was no need for Bowdoin and Adams to identify Perez Morton by name. The scandal gained strength with the announcement of the publication of the first American novel, The Power of Sympathy Or, the Triumph of Nature, in January 1789, five months after Fanny’s death. Although the novel was set in Rhode Island, its plot was clearly the story of Fanny Apthorp and Perez Morton, whose name was only weakly disguised as Mr. Martin. After Sarah Wentworth Morton’s death she was wrongly supposed to be the author of The Power of Sympathy, but it was later shown to have been written by William Hill Brown, a neighbor of the Mortons in Boston who knew about the scandal. At the time of the novel’s publication in 1789, the Mortons had tried to prevent its distribution. The Mortons were later reconciled and they remained married, but Sarah soon lost a son who lived only a few hours. The affair apparently had no ill effect on Perez Morton’s career. He was elected to the Massachusetts House of Representatives in May 1794, and again in 1803, and in 1806 was elected speaker. He was appointed attorney general in 1811 and held the office for twenty years. 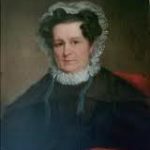 Sarah Wentworth Morton suffered greatly through this tragedy and her health deteriorated, but she held her family together. Although she never explicitly mentioned the scandal in her published work, the event is implicit in many of her poems. It may even have prompted her decision to become a serious poet, since emotional pain is a recurrent theme in her poetry and seems to have motivated her creativity. Her early poems were published in the Massachusetts Magazine and the Columbian Centinel. Soon after the scandal, her first published poem, “Invocation to Hope,” was published in the July 1789 issue of the recently established Massachusetts Magazine under the pseudonym Constantina. When Judith Sargent Murray claimed prior ownership of that pen name, Morton changed hers to Philenia, the name under which she became best known as a poet. Morton’s publications included poetry contributed to literary magazines. Besides her neoclassical poems, which often used heroic couplets and ballad stanzas, Morton also wrote hymns and sonnets. Her subject matter was both personal and public and often patriotic, celebrating the new nation, its ideals and its leaders. Morton’s work also reflected a woman with definitive opinions about many of the period’s topical issues, including the plight of Native Americans. Published in December 1790, Morton’s book length poem, Ouabi: or the Virtues of Nature; An Indian Tale in Four Cantos, was one of the first works to use Native American themes in American verse. Ouabi is a tale of interracial romance on the Illinois frontier that used native materials in an epic form. It tells of a love triangle involving Azakia, an Illinois war chief, his wife Zisma and Celario, a young Anglo-American inspired by Azakia and in love with Zisma. Celario fights in Azakia’s war until he is wounded and returns to the care of Zisma. At the end of the poem Azakia chooses to die, an act that retains his dignity and frees Zisma and Celario to love one another without guilt. Although clearly influenced by romanticism, Morton’s depiction of Indian life is based on historical research and is especially indebted to the Letters of William Penn. This work also contains a four-page introduction by Morton and a number of prose notes on Indian councils, war feasts, the Mississippi River, marriage ceremonies, the Indian concept of revenge, etc. Ouabi inspired one of America’s first orchestral scores, “The Death Song of an Indian Chief” (1791) by Hans Gram, and also became the basis of Louis James Bacon’s drama The American Indian (1795). During her lifetime, Sarah Wentworth Morton’s fame rested on her advocacy of freedom. Perhaps her best known poem on that subject, which appeared in the June 9, 1792 issue of Columbian Centinel under the title “The African Chief.” It was widely reprinted, and frequently recited by abolitionists in the nineteenth century. The horrors of the quivering wheel. Morton’s 1794 poems “Marie Antoinette” and “Bativia” reveal that she did not share her husband’s pro-French sentiments. Morton’s verses continued to appear regularly in the Massachusetts Magazine‘s “Seat of the Muses” column through 1793 as well as in the Columbian Centinel until 1794. They were also reprinted in Philadelphia, New York and New Hampshire journals. In 1797 Sarah Wentworth Morton published another book length poem, Beacon Hill, A Local Poem, Historic and Descriptive, celebrating the love of freedom expressed during the American Revolution. The poem, dedicated to the Revolutionary soldiers who fought under George Washington, looks at the end of the Battle of Bunker Hill, the siege of Boston, and the Declaration of Independence and pays tribute to Washington and the Revolutionary leaders in each colony. Sarah Wentworth Morton believed that social order was best fostered by political freedom and that freedom fostered compassion and justice. The companion volume to Beacon Hill, The Virtues of Society, A Tale Founded on Fact (1799), was dedicated to Abigail Adams. Sarah Wentworth Morton’s published works of the 1790s received praise from her contemporaries, who called her the American Sappho after the Greek lyric poet. Like Anne Bradstreet, Morton wrote about moral ideas and spiritual events. Like Lydia Sigourney, she wrote poems about and with emotion, but Morton’s romanticism was tempered by realism. Perez Morton purchased the land and had a home built at the corner of Dudley and Burgess Streets in Dorchester, Massachusetts in 1794. He and Sarah moved there from Boston in late 1796 or early 1797. 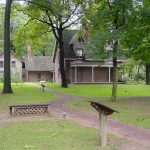 The Mortons moved in 1808 to a piece of land purchased by Sarah at what is known as Allen’s Plain; the house was known as the Pavilion. After the turn of the century, Morton’s poetry appeared occasionally in the Monthly Anthology and Boston Review until 1807. She withdrew from publishing between 1807 and 1823 but not from society, for she was celebrated as a literary hostess during these years. Three poems in My Mind and Its Thoughts appear to date from the period of her sister’s affair with her husband. They are an essay on “Marriage,” a poem, “Stanzas to a Recently United Husband,” and another poem, “Conciliation.” “Lamentations Of An Unfortunate Mother, Over The Tomb Of Her Only Son” is extremely personal and sad (son Charles died in 1809 at age 23). In an essay called “The Sexes” she wrote that “it would seem that man was sent into this breathing world for the purpose of enjoyment – women for that of trial and of suffering…. How then is it possible for her to dispense with the promises, the prospects, the consolations of Christianity?” Her “Apology” at the end of the text suggests that writing brought her consolation from the many disappointments and grief she experienced in her life. Perez Morton died in Dorchester on October 14, 1837, and left all of his real and personal estate to “my beloved wife Sarah Wentworth Morton.” After his death, Sarah returned to Braintree (by then known as Quincy), where she lived until her death and where she was a devoted member of the Episcopal congregation of Christ Church. Sarah Wentworth Morton died at Quincy, Massachusetts on May 14, 1846, at age eighty-six. Funeral services were held at Christ Church in Quincy on Saturday, May 16. By the time of her death, her fame as a poet had long since been forgotten; none of her obituaries in the Quincy Patriot, Boston Daily Mail or Daily Evening Transcript made any mention of her literary career, noting simply that she was the widow of the late Honorable Perez Morton.